How to Access Amazon Prime from Anywhere? Amazon Prime is a great service that has amazing content. The latest Season 8 for Game of Thrones is also available on Amazon. However, if you are outside the US, you will need PureVPN to change your virtual location to the US and access GoT episodes on Amazon Prime. How Can PureVPN Help In Streaming Amazon Prime Efficiently? Your internet provider is legally bound to keep tabs on your activities. That’s right! Every website that you visit and every video you stream is logged by your ISP. PureVPN enables you to mask your original IP with a pseudo one. This gives you the added advantage of becoming invisible to your ISP, thereby making it incapable of logging your activities. Since your ISP cannot see your activities, it cannot throttle your speed. PureVPN boasts 2,000+ servers placed in more than 140 countries at 180 different locations. The network is optimized to ensure efficient streaming, so users can enjoy a lag-free streaming experience. Amazon Prime is currently available in more than 200 countries. However, its content varies according to region. To break free of region-restrictions and view content that you actually like, just connect PureVPN's Amazon Prime VPN. This will mask your real location and make all video content accessible to you. Benefits you can get with PureVPN! Get unlimited access to any content on the internet so you can browse the internet freely. So you face zero road blocks when you’re surfing for your favorite content on the internet. Which means zero hiccups when you’re streaming anything online. Speeding bullets are fast. Streaming with PureVPN's Amazon Prime VPN is faster! Put on a cloak of invisibility when you’re surfing for anything on the internet. Facebook, YouTube, Instagram, Twitter are just a click away. 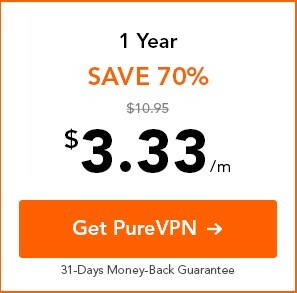 Does PureVPN come with Amazon Prime account? No. Amazon Prime is a separate product that needs to be subscribed for separately. We are not associated with Amazon Prime, but our services support it. Can I stream video content from Amazon Prime when I am travelling outside the US or Puerto Rico? Yes you can. All you need to do is select a server from US or Puerto Rico when connecting PureVPN. This will change your location and make the content available to you. Would PureVPN work if I want to stream my favorite tracks from Amazon Prime Music? PureVPN offers complete compatibility for Amazon Prime Music. Users can stream music just as easily as they would stream video content. I have Xbox 360 and a PureVPN subscription integrated on my DD-WRT router. Can I stream freely too? Will I get Amazon Prime subscription for free with PureVPN? No. Our package plan only covers our services. If Amazon finds out that I am using their services outside the US and through a VPN, will my account get banned? The only way for any service to know your real identity and location is by your IP. Connecting a VPN essentially means that you can change your IP. Once you get assigned an IP from US, no one apart from you can tell that you are not actually in US. Is it illegal to use PureVPN and access Amazon Prime in regions where it is not available? No it is not. Using a VPN is not illegal, while Amazon Prime is an entertainment service for everyone. Currently the infrastructure of Amazon Prime makes it possible for them to offer their services only in the US and Puerto Rico. However, this limitation can be overcome by using PureVPN which can enable you to use Amazon Prime from anywhere in the world. Can I stream Amazon Prime while travelling? Of course! The whole idea of streaming via our Amazon Prime VPN is to enable you to stream anything from anywhere, even when you are on-the-move. How to set up a VPN with Amazon Fire TV stick? Setting up a VPN for accessing Amazon Prime is a very simple three-step process. For a detailed setup guide, click here. Do I need an Amazon Prime membership to stream Amazon Video? Yes. Unlike any other premium streaming service, Amazon Prime offers its users a monthly subscription against a small fee. Once you have subscribed to a premium Amazon Prime Video plan, only then you will be able to stream any content from Amazon Prime. Not all VPNs affect video streaming quality. If you opt for a good VPN that’s optimized for streaming, such as PureVPN, your overall streaming experience will improve significantly. PureVPN has more than 2000 servers optimized for unblocking most popular streaming platforms and video content distribution websites. PureVPN is reputed in providing the most amazing buffer-free and lag-less experience you can ever imagine. It makes cord cutting simpler, better, and totally worth it. What to do in case of Amazon VPN not working? If you VPN has stopped working with Amazon Prime, you can easily troubleshoot it. A few errors in or issues in settings can cause Amazon Prime to not work with PureVPN. Read here to troubleshoot your issue.